Three LCA seniors produced sophisticated projects through their efforts in Advanced Senior Research program. Over the course of their final year at Lexington Christian Academy, three outstanding graduating Seniors completed capstone projects through the Advanced Senior Research program. In the program, Michael Burrowes of Woburn, MA, Noah Parker of Arlington, MA and Drew Pelusi of Winchester, MA chose subjects they held deep passions for among the fields of academics, arts and service. The results were presented during a special, celebratory exposition on May 24th in front of the ASR committee, faculty and parents. 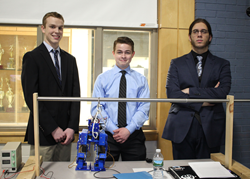 Burrowes, Parker and Pelusi each produced sophisticated projects through their efforts in Advanced Senior Research. Burrowes delved into the field of audio synthesis, advancing his skills in coding, instrument construction, and musical composition and conducting. Parker described his project as “involving designing, building, and programming a 3D-printable bipedal robot. The robot is easily replicable and affordable, making simple bipedal robotics more accessible for education.” Finally, Pelusi worked to create a 3D video game with an original concept that he designed and programmed. Advanced Senior Research, described by Jackson as an “intellectual odyssey,” annually furthers the school’s pursuit of the integration of faith and learning, and serves as another testament to the numerous opportunities that come with an education at LCA.